The global command, control, communication, computer, intelligence, surveillance, and reconnaissance (C4ISR) market is highly consolidated with the top four companies accounting for nearly 84% of the market in 2016. The names of the four leading companies are BAE Systems PLC, General Dynamics Corporation, Lockheed Martin Corporation, and The Raytheon Company. Top players are concentrating on taking advantage of technological advancements and developing innovative products. The market needs dynamic business environment and consistent evolution of technology for its progress, says Transparency Market Research (TMR) in a recent report. Thus, companies often need to align themselves as per latest technologies to stay competitive in the market. 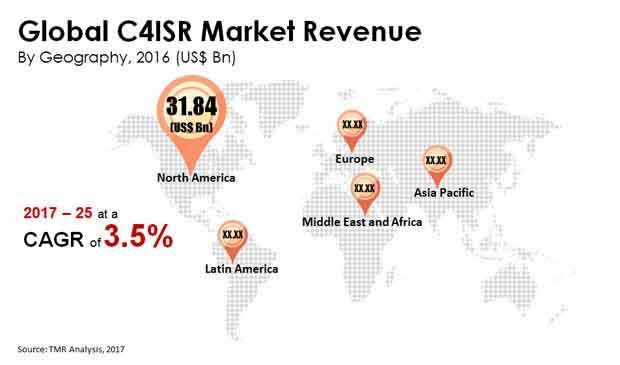 According to TMR, the global C4ISR market is expected to rise from US$98.46 bn in 2016 and reach US$134.89 bn by the end of 2025. The market is expected to expand at a modest CAGR of 3.5% from 2017 to 2025. On the basis of application, the electronic warfare segment is leading in the market, on account of the growing cross-border unrest and tensions. The surveillance & reconnaissance segment is the second leading application segment, trailed by the tactical communication segment. By end user, the airborne segment accounted for a massive 56.5% of the market in 2016. The growing demand for C4ISR in developing nations such as China and India are behind the growth of the airborne segment. Moreover, the demand is also increasing for advanced technology for border protection and this will drive the demand for C4ISR in the airborne segment. According to a TMR analyst, the increasing acquisitions of UAVs and unmanned aerial combat vehicles will fuel the airborne segment towards growth in the period from 2017 to 2025. On the basis of geography, by accounting for 32.3% of the market, North America emerged as the leading regional segment in 2016. “However, this is expected to alter and North America’s leading position will be taken by Asia Pacific,” says TMR. North America is anticipated to become the second leading regional market, followed by Europe. While North America market is leading currently on account of government’s constant efforts to implement the latest technology to combat terrorism, Asia Pacific market is expected to be driven in the near future on account of the high demand for C4ISR from countries such as Japan, China, and India and increased spending on military and defense sectors. China is in fact leading in terms of high spending towards military and defense sectors. The main factor driving the global C4ISR market is the growing demand for mobile command systems from countries such as the UAE, Brazil, and China. These nations have faced terror attacks or security threats recently and are thus, concentrating on acquiring advanced C4ISR systems. Security threats and terror activities have also compelled governments across countries to increase their funding towards military and defense forces and equip their forces with the latest equipment and systems. Border security is another major concern for countries such as India, Japan, Australia, China, and South Korea. Thus, there will arise a heightened demand for C4ISR systems during the forecast period from Asia Pacific, which will drive the overall market. One of the key factors restraining the growth of this market is the decrease in spending towards military and defense sectors in developed nations, as they are likely to spend more funds on maintaining their existing systems. However, the development of next generations IP systems will drive the C4ISR market towards growth as these systems ensure enhanced communication between armored personal carriers, combat vehicle crew, and main battle tanks. Implementation of secured networks will also boost the growth of the C4ISR market in the coming years.